The first Sunday morning hockey game of the season. Ah yes, that signals the start of good weather. Wait, why are we inside playing hockey??? Duh, because it's like A/C! I can't really understand why we ever played roller hockey in the summer though. Try adding hot to hotter... I digress. So the game was pretty much inconsequential, partly because I did my best impersonation of a beached whale and really, the game was only impeding the road to eats. As such, Kaiser Soze and JuJu accompanied me for our inaugural eating escapade of the summer hockey season. Unfortunately, both were in a rush and we needed to find fast eat s which didn't involve a drive-thru. We went for the standby which was good ol' Pho. 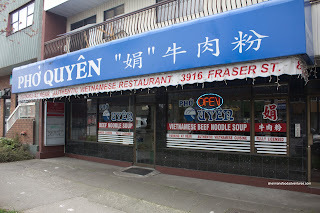 Seeing how we had hit up almost all the nearby places, we headed up to Fraser to try out Pho Quyen. Seemingly always appearing to be closed, the place does not looking inviting. Not to worry, the dark exterior only hides the bustling activity inside. Despite the decent size of the restaurant, the rectangular tables were somewhat small and for 3 guys, it was cramped seating. It was also a challenge to fit everything we ordered as well. If it were solely up to JuJu, we would've had twice the amount of food! I think he should meet Mijune... So we started with a couple of appies including the Fried Chicken Wings. These were not exactly what I expected, but they were good nonetheless. 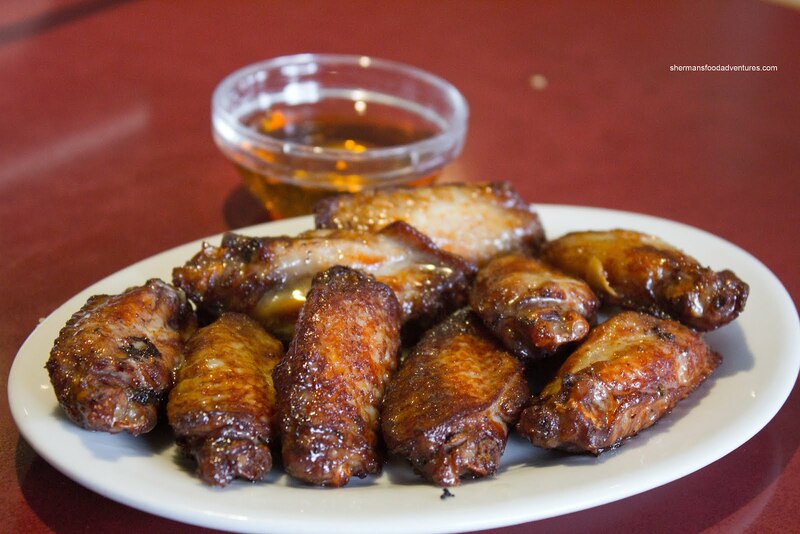 Consisting of only the middle portion of the wing, these resembled fragrant soy wings than the typical fried version. With the light fry job, the meat was tender and moist while the skin was still somewhat soft. There was no need for the sweet fish sauce since the wings had plenty flavour of its own already. 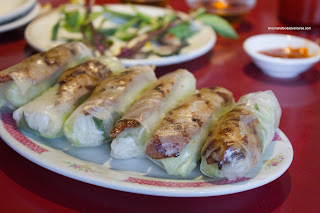 For our second starter, we had the Grilled Pork Salad Rolls. These miniature rolls were pretty good. The rice wrapper was perfectly moisturized (first time I've used that word in food!) where it was neither dry nor too wet. 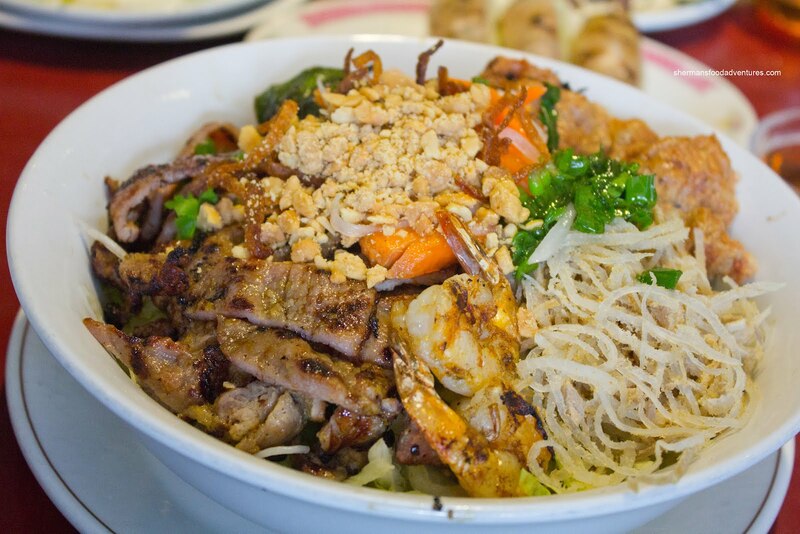 Inside lay rice noodles, crisp lettuce, basil and nicely grilled pork. It was quite strange we got the same sweet fish sauce as a dip rather than the hoisin peanut sauce though. 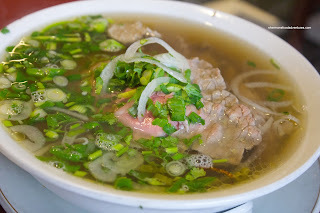 Kaiser Soze ended up with the Pho Dac Biet which was decent in portion size. The broth was pleasant tasting falling more on the sweeter side. We did appreciate that they were conservative with the MSG. The noodles were al dente and not clumpy while the plentiful meats were good quality and tender. 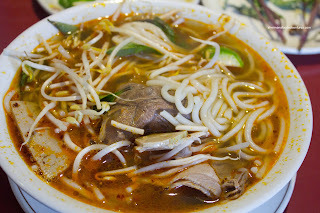 Seeing how the obligatory Pho was already ordered, I went for the Bun Bo Hue. Despite the absence of the pork knuckle, there was still plenty of tender pork and beef. As with the Pho, the lai fun noodles were al dente as well. At first, I didn't have much in the way of expectations for the broth, yet it turned out to be quite decent. There was an obvious hit of lemongrass and there was enough chili oil to add a good kick. Unlike the Pho broth, this was heavily salted. JuJu didn't go for anything soup-based and had a Vermicelli Bowl consisting of grilled pork, shrimp, bo la lot and shredded pork. This was a healthy portion which was good, but the meat was dry and overcooked. Furthermore, the much hyped-up shrimp skewer ended up to be pretty standard. In the end, this bowl was probably the only thing that was not that great with our meal. Pho Quyen can be categorized as "above-average" Vietnamese food and surely a potential place to re-visit. We just wished it actually looked open from the outside!